Welcome to our 5th guitar lesson for beginners. This lesson is dedicated to a very important aspect of advancing as a guitarist, getting to know the fretboard and the notes you can play on the fretboard. It may seem overwhelming, but I'll teach you a simple way of memorising the notes on the fretboard. This lesson concentrates more on theory than actual playing, but is all the more important. Learn the notes on the fretboard and keep in tune, and practice every technique you've learned in the previous lessons. 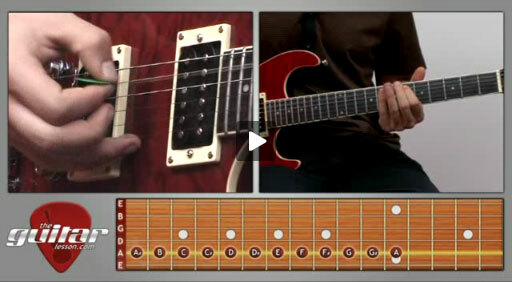 go back to our free guitar lesson videos for beginners. Sorry, but you've reached a premium content area. The download of the Guitar Notes and Tuning – beginner guitar lesson #5 tablature file is only available to premium members. Sorry, the same goes for the backing track. To download the backing track to Guitar Notes and Tuning – beginner guitar lesson #5, please log in and revisit this page. Tom, I have been learning the chords ok. It is getting easier and my fingers are toughening up some which is helping a great deal. Switching chords G-D-C sounds like a car wreck. I’m clunky and can’t keep up with the beat. I can only hope I can get past this. Oh you will, everyone goes through this. Just practice those chord changes a lot, and they’ll become natural. It won’t happen instantly, but the more you practice, the quicker you’ll get there. As I mentioned, keep it slow and accurate at first, and you’ll speed up naturally. It may get frustrating at times, but when it does, remember that everyone went through this. Every super famous guitarist was, at one point, where you are right now.